Luckily, it’s easier to do than you might expect. We’ve compiled our list of strongest tips for great first impressions that become long-lasting impressions. No matter what industry you’re in, these moves will single you out from the crowd in an organic and honest way. Before you get started on your exhibit and campaign design, it helps to know what kind of outside “distractions” you’ll be up against. Check out who your main competition will be based on a list of attendees. If you’re researching far in advance, attend the trade show a year early and feel out the place. At least check out old booths online and figure out the current status quo for your show – that way your brand will have a much better chance of rising above it. An effective way to stand out is to make sure people have heard your name well before you get to the show. This is probably the most difficult tip to apply, but any effort you make can go a long way in giving your brand name some lip service. Market yourself and remind the world of your show presence over social media, through press releases, and with strategic advertising, both before and during the event. You can even use humor and/or shock value to make your point, if appropriate. A unique campaign will never fail to make newcomers recognize you quickly on the floor. The most surefire way to snag immediate attention is with an attractive booth. An emphasis on good design will always help draw the eye away from neighboring exhibits, especially with strong, quality graphics and the right deliverables (e.g. standalone posters vs. integrated booth design). You can also use your displays to announce benefits and giveaways, which might include drinks and a party atmosphere, or something low-hassle like free quotes or discounted on-site services. The more of an “attraction” you can make your booth, the more people you’ll attract. Often what makes your brand the most memorable for attendees that stop by the booth is the unique people that you have representing said booth. Carefully select your trade show staff members; train them in important areas like sales and customer service, and make sure they have a natural knack with people. It usually helps to prioritize employees with a charming, safe sense of humor. Handing out traditional swag isn’t enough to make a mark. Your handouts have to be unique to help you stand out among the rest of the pen-throwers out there. Whether you pass out wacky, original items, or opt for standard items with interesting messages, make sure to color outside of the lines for best results. It goes a long way to elevate your brand well before the big day. Time and time again we see firsthand that those who put in the time and energy to think these through ahead of time have the most success at showtime– and beyond! If you need help with this part of the process, call Mackenzie Exhibit because this is what we do! Reach us by phone at 1-877-381-9133 (EXT 3), email us at carmin@nullmackenzie-exhibit.com, or fill out the form on our website to request a free quote. Whether you’re a veteran of the trade show industry or you’re preparing for your very first trade show, it’s important to nail down the design details of your exhibit. The design of your trade show exhibit is the fundamental variable for attracting and maximizing foot traffic to your booth. Unfortunately, not everyone is a natural trade show booth superstar by nature. That’s where Mackenzie Exhibit comes in. Mackenzie Exhibit has been helping companies of all sizes maximize their trade show exhibits for over 30 years with innovative, cost-effective solutions. Here’s how working with a team of design professionals can help generate serious results for your business at the next professional trade show. Having your trade show exhibit stand out amongst the competition at industry trade shows can often be challenging. The design of your trade show booth can often be the difference between a potential customer passing by or stopping to inquire and learn more. Making use of bright, bold graphics throughout your booth along with a clear message will help generate interest and maximize foot traffic. At Mackenzie Exhibit, we specialize in unique, eye-catching designs that will help build this interest. Our team of custom trade show designers and builders are highly flexible when it comes to helping you achieve your trade show objectives. We’ll work alongside your team to ensure your custom trade show booth effectively represents your brand and helps bring your vision to life. Our skilled craftsmen and project managers will take care of all of the details, so you can focus on qualifying leads. 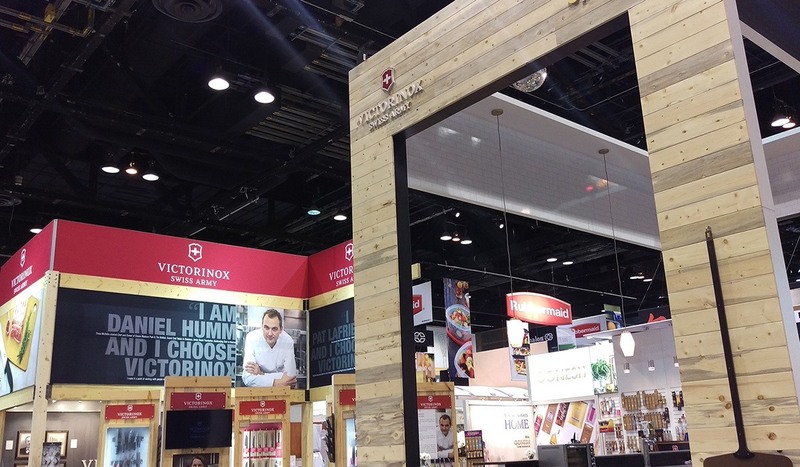 There’s a reason why leading brands continue to partner with Mackenzie Exhibit for their custom design trade show exhibits. From the pre-design stage to the functional requirements, we’re all about the details. Visit our testimonials page to see what some of our clients say about their trade show experience with us. No matter what type of industry you’re in, Mackenzie Exhibit can help amplify your company’s trade show efforts with innovative, cost-effective solutions that will maximize your booth’s return on investment. Leave the design of your trade show booth to us, so you can focus on interacting with potential customers and valuable leads. For questions and inquiries, please contact us through our web page or request a free quote. The entire mackenzie EXHIBIT team has spent the last few months designing and building our new office space inside the Ogden, Utah facility. Now just in time for summer, we are all moved and thrilled with the results. Event apps have long suffered from low downloads and small adoption rates, but Google’s Instant Apps could be a much needed solution to these problems. Designing great trade show product displays is an art that when done correctly can enhance your trade show experience by converting leads to sales. Best Booth! It’s always rewarding when hard work pays off. Our client LIGHTHEADED (formerly Dasal Architectural Lighting) was awarded best booth at LIGHTFAIR International over the weekend in San Diego. The first couple months of the year show a positive increase in several key benchmarks for the trade show industry, according to the publication Trade Show Executive. Branding a multifaceted company is one of the most difficult tasks a designer can face. These companies feature products that superficially appear to have nothing in common, yet one message is expected to be clearly communicated throughout each and every product line. We pose this question to you because that is how conversations usually start. You shake someone’s hand, tell them good morning and ask how they are doing. And as we at mackenzie EXHIBIT introduce our new blog, we intend to start exactly that, a conversation. After the exchange of pleasantries, one person in the conversation might make a comment about the weather. Here in Ogden, it is a gorgeous early spring day with temperatures beginning to warm up. There is also a nice cap of snow on top of the foothills above us. Then if the two people in the conversation know each other, they may dive into some familiar gossip or catch up on the events that transpired since their last meeting. If the two people do not know each other, they will introduce themselves. We will go first. We are mackenzie EXHIBIT and we are trade show experts. Our company is made up of brilliant designers, dedicated craftsmen and trade show professionals. We harness this talent to build bold trade show exhibits that emphasize the unique characteristics of each one of our clients’ brands. But our work doesn’t stop there. Our team of artists and builders will create brand aligned spaces wherever you are, including office space design and retail/showroom design. Our main focus is working with our clients to make sure their brands stand out wherever they are. All of this work hinges on creativity, design principles, graphic production, craftsmanship, shop automation and more. As our conversation continues, these are the topics we will discuss in later posts. More specifically we will talk about how these concepts can be utilized to generate success at trade shows. We will also discuss the latest news and trends taking place in the world of trade show marketing and what we are doing to impact that world.